Over the course of the last half-decade, Missouri Tigers football has experienced some of the best success in program history. Three double-digit-victory seasons in the last four years, wins over Big 12 powers Nebraska and Oklahoma, and six straight bowl bids, including a Cotton Bowl romp over Arkansas a few years back. But the thing that's eluded Mizzou is big-time success, in the form of a conference championship or a BCS bowl bid. Last year the Tigers returned 15 starters, and then started 7-0, with wins over top-ranked (at the time) Oklahoma and eventual Cotton Bowl-qualifier Texas A&M. This got Missouri to No. 7 in the rankings. But then they lost back-to-back at Lincoln and at Lubbock, which cost them a shot at a berth in the conference championship game. The Tigers then won their last three regular-season games but finished on a down note with a loss (as two-point favorites) to Iowa in the Insight Bowl to end up at 10-3. Missouri also went 7-6 ATS last year,, covering as favorites of 42 points (vs. McNeese State), 20 (over Miami (Ohio) and 24 (over Kansas). And they went 2-1 both SU and ATS as underdogs. The Tigers also went 5-8 on the ‘over/unders,’ mainly because all but one Tigers game had a total posted in the 50s. And yet Mizzou games, thanks largely to a defense that allowed a league-low 16 points per game, averaged 46 total PPG. The big question about Missouri this season is how they'll fare without QB Blaine Gabbert, who left school with one season of eligibility remaining and went as the 10th overall pick in the NFL Draft. The Tigers return 15 starters, nine on offense. And they've had success recently replacing quarterbacks. So while Mizzou is being picked to finish right around fourth in the Big 12 this season by various “experts,” they've got the potential to surprise. Gary Pinkel is in his 11th season as the head coach here, and has guided the Tigers to 40 wins over the course of the last four years and a No. 4 ranking in the final polls four seasons ago. Missouri under Pinkel has had success recruiting, especially at the skill positions, and they've developed some pretty good quarterbacks. 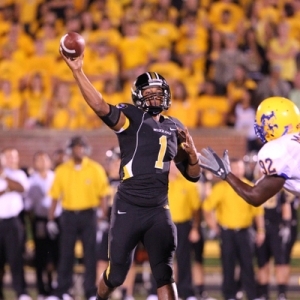 And if Pinkel can get some decent play out of his new QB this year the Tigers should be just fine. They might even be underrated on the point spreads, at least for a while. The loss of Gabbert is huge, but then again the Mizzou passing game only ranked ninth in the Big 12 in passing efficiency last year. This unit ranked seventh in conference play at 386 yards per game, and fifth in rushing at 167 YPG. And they committed just nine turnovers in conference play, second-fewest in the league. This year sophomore James Franklin, Phil Steele's No. 19 in his quarterback class, is likely the new starter at QB, and fortunately for him the cupboards are stocked. The Tigers get back last year's top three rushers, the entire receiving corps, including a couple of guys who caught 90 balls last year, and four senior starters along the O line. And K Grant Ressel is back after going 26-for-27 on field goals last year. One thing that concerns us, though, is that Missouri posted a +11 turnover ratio last year, and that will be tough to duplicate. This unit was quietly solid last year, ranking first in conference play in points allowed at 16 PPG, fourth in yardage at 366 YPG and first in sacks with 29. However, the Tiger D allowed Illinois and San Diego State to run for more than 200 yards in close victories, couldn't stop Roy Helu in that season-crushing loss to Nebraska, let Texas Tech run for 198, K State 187 and Iowa for 225 yards in the bowl game. And Gabbert wasn't the only Tiger to leave school early and get drafted in the first round; Missouri also lost DE Aldon Smith, who went No. 7 overall on draft night. This unit gets six starters back for this year, including five of the front seven, but they'll have to replace three-quarters of the starting secondary. So while the Tigers should be strong up front, things are a bit iffy in the backfield. Mizzou and its new quarterback start off with what should be pretty good Miami (Ohio) team, visit Arizona State and open the Big 12 season at Oklahoma. Later on they get OK State at home, visit A&M, get Texas at home and finish with the rivalry game with Kansas on a neutral field. So the key to the season is getting off to a good start, holding serve at home, and winning a game or two as underdogs. WagerWeb is offering Mizzou at +1,200 to win the Big 12 this season, and that might be worth a flyer bet. Bodog is listing the Tigers at 80/1 to win the BCS Championship. If Missouri can win at Arizona State, split vs. the Sooners and Aggies and win all its home games, 2011 could be that breakthrough season. But that's probably asking a lot. Eight wins is very possible, but playing in a Big 12 that's got four other really good teams means double-digit wins is a stretch.